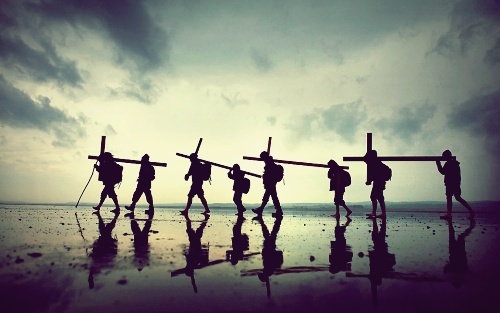 Disciples are cross-bearers; they identify with Jesus Christ and imitate him in life and in death. May the grace and peace of the Lord Jesus Christ be with you all. Our sermon text for today comes from Luke 9:18-26. Please stand and hear the reading of God’s word. The word of the Lord Jesus Christ. May God add his blessing to the reading, preaching, and hearing of his word. And the church says: Amen! Once there was a man named Charlemagne (c.742-814). He lived between the 8th and 9th centuries. He embarked on a mission to unite all Germanic peoples into one kingdom, and convert his subjects to Christianity. He was skilled military strategist and he spent much of his reign engaged in warfare in order to accomplish his goals. Eventually, he was crowned as Emperor. He did more than fight wars; he also encouraged a cultural and intellectual revival in Europe. When he died in 814, Charlemagne’s empire encompassed much of Western Europe, and he had also ensured the survival of Christianity in the West. Today, Charlemagne is referred to by some as the father of Europe. One hundred and eighty years after his death, in about the year 1000, officials of the Emperor Otho opened the tomb of Charlemagne, where they found an abundance of treasures. But they saw something even more amazing than all the treasures. And if you hang in here with me, I will tell you what they saw in just a few minutes. Let me ask you: Do you want to come after Jesus? Do you want to walk behind him and follow after him no matter where he goes? Do you really know what you want when you say you want to follow Jesus? Dietrich Bonhoeffer is often quoted for saying, “When Christ calls a man he bids him come and die.” That’s a catchy slogan. It would look good on a meme, or a T-shirt, or even a bumper sticker. Yet, that is not exactly what Christ commands. When Christ calls a man he bids him come and do something far more difficult and demanding than just die. He bids him come and live — in an on-going, daily, rhythm of self-denying and cross-bearing. He bids him come and walk in the slipstream of his cross. If anyone wants to come after me as a disciple, he must do three things: he must deny himself, and he must take up his cross daily, and he must follow me. If you want to come after Jesus, you must deny yourself. For many people, self-denial is just the opposite of self-indulgence. You want to eat a fudge sundae, but you’re trying to be good, so you eat a celery stalk with a dab of peanut butter instead. That’s a form of self-denial. But that is not what Jesus had in mind. For some people, self-denial equals self-destruction. I can’t tell you how many times I have heard people describe self-denial as a form of a spiritual suicide. Jesus never called anyone to act like a kamikaze or a terrorist. Self-denial is not the same as self-murder or self-mutilation. Again, that is not what Jesus had in mind. Jesus never calls anyone to kill himself. Cross-bearing involves forms of struggle and suffering–but it is not a form of spiritual suicide. One is deeply Christ-centered; the other is radically self-centered. To deny yourself is to define yourself according to Christ and the cross. To deny yourself is to denounce your own ambitions, beauty, comforts, desires, ego, fame, and goals for the sake of Christ and the cross. To deny yourself means devoting yourself to Christ as the Sovereign Lord of your life. It means recognizing that you are not Invictus; you are not the master of your fate, or the captain of your soul. Do you still want to come after Jesus? If so, you must take up your cross daily. When Jesus spoke these words to his disciples in the first century, crosses were being used day after day as a means of capital punishment. People who were considered enemies of the state were punished and crucified in public. In this way the Roman Empire send a graphic message to everyone that this is what happens to enemies of the state. He called them to live, move, and exist as a people going up to Golgotha in Jerusalem, constrained by the Spirit, not knowing what will happen to them there, except that hardships and afflictions await them. He was calling them identify with him and imitate him in life and in death; to make conscious and deliberate preparations to live, suffer, and die — even as enemies of the state. We have been crucified with Christ. It is no longer we who live, but Christ who lives in us. (Gal. 2:20). All those who belong to Christ Jesus have crucified the flesh with its passions and desires. (Gal. 5:24). If you are a baptized Christian, your life is signed and sealed with the cross, and now your life must become shaped and molded by the cross. All baptized Christians are Cross-bearers. We are united to Christ in his crucifixion and resurrection through our baptism. His death is our death; his life is our life. We identify with Christ in our baptism; we imitate Christ from our baptism. If you are a baptized Christian, you are a cross-bearer, so take up your cross every day. Make every effort to consciously and deliberately identify with Christ and imitate him as a cross-shaped and cross-sustained person. That’s true. But that only focuses on negative aspects of cross-bearing. There are positive aspects of cross-bearing as well. It can also be liberating, powerful, and full of joys. Do you want to come after Jesus? If so, you must follow him. The word follow means stick close to him, like a student with his teacher; and stay close to him, like a servant with his master, wherever he leads, no matter what. To follow Jesus is to look at him, to listen to his word, to labor in love, and to live for others the way he did. To follow Jesus is to be led by Jesus. Where is he going? Where is he leading us? What is he teaching? He calls us to follow him. He is leading us to the altar of sacrifice; to the valley of decision; to the mount of death; to the edge of the world. He calls us to come after him because that is the safest place in the world. He takes the hit, bears the judgment, endures the storm. We hide behind him in the shelter of his wings. Do you still want to come after Jesus, to identify with him and imitate him in life and in death? If anyone wants to save his life he will lose it, but if anyone loses his life for my sake he will save it. The word save also means deliver and rescue. The word lose also means destroy and ruin. So if anyone wants to deliver his life he will destroy his life; but if anyone destroys his life for my sake he will save it; if anyone wants to rescue his life he will ruin it, but if anyone ruins his life for my sake he will rescue it. Notice the reason for losing, destroying, and ruining your life: for Jesus’ sake, not for your own sake. Again, Jesus is not calling for self-destruction; he is calling for self-denial. He wants us to identify with him and imitate him in life and in death. This one of the most counter-intuitive things Jesus ever said. It cuts against the grain of our culture; it cuts against the grain of the church. Even though we know that Jesus said, “If anyone wants to save his life he will lose it, but if anyone loses his life for my sake he will save it,” we still struggle to believe him. We want to save our life without losing our life. We want to be rescued without being ruined. We want to be delivered without being destroyed. We want the crown without the cross. We want to know what we must do to inherit eternal life, but we sell out to receive it. We want our best life now and eternal life later. But what do we want to be saved from really? The devil. The world. Sorrow and pain. Sin and death. Wrath and hell. What about self? Do you want to be saved from your self? And what do we want to be saved for? Peace and comfort. Eternal life. Heaven. What about service and sacrifice? What about Jesus? Do you just want to be saved from judgment, or do you want to be saved for Jesus’ sake as well? As Luther said, “The cross puts everything to the test.” Right now it is putting us to the test; it is putting our hearts, our motives, and lives to the test. Do you still want to come after Jesus? Do you still want to be saved? If so, you have to identify with him and imitate him in life and in death. Well, this is as good a time as any to finish telling you the story about the tomb of the great king Charlemagne. The cross shows us that there is much more to life than personal comforts, riches, and pleasures. As light follows darkness, and life follows death, so glory follows shame, and the crown follows the cross. If you want to come after Jesus, you must identify with him and imitate him in life and in death.